The PwrPak7 and PwrPak7D are compact, lightweight and robust. These enclosures are easy to integrate and deliver scalable Global Navigation Satellite System (GNSS) with internal storage and INS options. They are capable of tracking with their 555 channel all present and upcoming GNSS constellations and satellite signals. This enclosure includes intelligent interference detection and mitigation together with multiple communication interfaces for easy integration and installation. Both enclosures have a powerful OEM7® GNSS engine inside and offers built in Wi-Fi, on board NTRIP client and server support and 16 GB of internal storage. Included: a web user interface, accessible through Ethernet or Wi-Fi, that allows for quick and easy system configuration and control. The PwrPak7 (with single antenna) is ideal for base station or rover applications. The PwrPak7D has a Multi-frequency, dual antenna input that allows the PwrPak7D to harness the power of NovAtel CORRECT™ with RTK and ALIGN functionality. This makes the PwrPak7D ideal for land applications, marine or aircraft based systems, providing industry leading GNSS multi-constellation heading and position data in static and dynamic environments. The PwrPak7-E1 and PwrPak7D-E1™ provide exceptional positioning and are ideal for automotive, airborne and other unmanned systems. 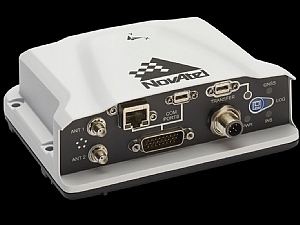 These new enclosures includes NovAtel’s deeply coupled GNSS+ Inertial SPAN® technology and Interference Toolkit that assure positioning anywhere, providing an advanced range of software options. The absolute accuracy of GNSS positioning and the stability of Inertial Measurement Unit (IMU) gyro and accelerometer measurements are deeply coupled to provide an exceptional 3D navigation solution that is stable and continuously available, even through periods when satellite signals are blocked. Capable of tracking all present and upcoming GNSS constellations and satellite signals, the PwrPak7-E1 is a robust, single antenna, high precision receiver that is software upgradable in the field to provide the custom performance required for your application demands. The PwrPak7D-E1™ has a dual antenna input. The Multi-frequency, dual antenna input allows the PwrPak7D-E1 to harness the power of NovAtel CORRECT™ with RTK and ALIGN functionality. This makes the PwrPak7D-E1 ideal for dynamic ground applications, marine or aircraft based systems, providing industry leading GNSS multi-constellation heading and position data in static and dynamic environments. Both PwrPak7-E1 and PwrPak7D-E1™ contain an Epson G320N MEMS IMU to deliver world class NovAtel SPAN technology in an integrated, single box solution. Both Enclosures, have a powerful OEM7® GNSS engine, integrated MEMS IMU, built in Wi-Fi, on board NTRIP client and server support, and 16 GB of internal storage. All of NovAtel products are backed by a team of highly skilled design and customer support engineers, ready to answer your integration questions. Developed for efficient and rapid integration, NovAtel's GNSS products have set the standard in quality and performance for over 20 years. State-of-the-art, lean manufacturing facilities in our North American headquarters produce the industry’s most extensive line of OEM receivers, antennas and subsystems. These products are commercially exportable and provides an excellent price/performance/size GNSS+INS solution.